Language is an essential part of what makes us human. Where did it come from? How did it develop into the complex system we know today? And what can an evolutionary perspective tell us about the nature of language and communication? 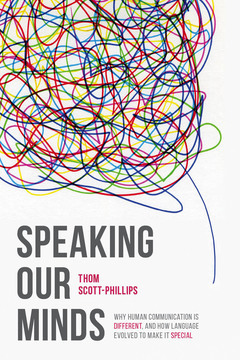 Drawing on a range of disciplines including cognitive science, linguistics, anthropology and evolutionary biology, Speaking Our Minds explains how language evolved and why we are the only species to communicate in this way. Written by a rising star in the field, this groundbreaking book is required reading for anyone interested in understanding the origins and evolution of human communication and language. 1. Two Approaches to Communication.- 2. The Emergence of Communication Systems.- 3. Cognition and Communication.- 4. The Evolution of Ostensive Communication.- 5. Crossing the Rubicon.- 6. Evolutionary AdaptationEpilogue: The Big Questions Answered. Thom Scott-Phillips is a research fellow in Evolutionary and Cognitive Anthropology, at Durham University, UK. He currently holds an Addison Wheeler Fellowship and a prestigious ESRC Future Research Leaders grant, and was previously a Leverhulme Early Career Fellow at the University of Edinburgh. He has spent the past 10 years studying and researching the evolutionary origins of human communication and language. His work has received multiple prizes and accolades, including the New Investigator Award from the European Human Behaviour and Evolution Association in 2011, and the British Psychological Society's award for Outstanding Doctoral Research in 2010.